Friday, February 24, 2017 7:30 PM Andy Dekaney High School AWAY 77 Pflugerville High School HOME 74 Game Recap The Dekaney Wildcats beat the Pflugerville Panthers with a score of 77 to 74 in the Texas UIL Boys Basketball Area Round Playoff game. Cameron Ivey had 26 points, 5 assists, 2 rebounds and 2 steals. 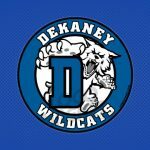 Tuesday, February 21, 2017 7:00 PM Andy Dekaney High School AWAY 79 Klein Collins High School HOME 56 Game Recap The Dekaney Wildcats beat the Klein Collins Tigers in the Bi-District Round of the Texas UIL Boys Basketball State Playoffs with a score of 79 to 56. Aren Thomas had 26 points and 3 rebounds.